Intriguing, as usual. I have not read a good Koontz book in quite a while so may have have to give these a go. It would be interesting, as I finished reading the original “Frankenstein” (again) not too long ago. Seems to me I have one called “Frankenstein in Chains” on my e-reader. Sounds like a good way to start the new year – C.S. Lewis and Koontz. Thanks for the literary direction! Good to hear from you again! I’ve been a big Koontz fan for quite a while now, not just because he’s a great writer but also the themes he explores. 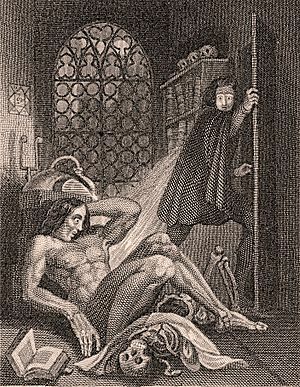 I still have yet to read the original “Frankenstein” by Mary Shelley. Guess I’d better get on the ball. I hear her theme isn’t so much about man playing God as it is about the way we treat people. What’s your take? Hope you and your family had a wonderful Christmas and New Year’s! It’s been a while since I read it, and I have a brain like a sieve these days, ha-ha! As I recall, the monster himself was quite thoughtful and verbal, musing a great deal on that very subject in his loneliness and anguish. HE was not at all the horror simpleton portrayed in the classic movies. Those moments in the movies where he demonstrates higher levels of thought and function (De Niro and Karloff both had them) are most like his behavior throughout the book. Thanks – hope you had a good holiday as well. Ours was lovely, other than coming home with “the plague”, as mentioned. As I said in the post, Koontz has the original “monster” in this series except his name is now Deucalion and he is quite thoughtful, as you point out. He also has some interesting . . . abilities, which I’m not sure he had in the Shelley book. By all means, you should read the series. Glad to add to your list! I’ll warn you: Koontz can be addictive. But he makes you think, too. Happy New Year! Hope your holidays were grand.